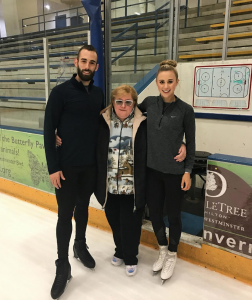 U.S. pair skaters Ashley Cain and Timothy LeDuc started their partnership in 2016 with lots of fanfare. The team gained unexpected success in their first season, winning a bronze medal at U.S. Nationals and appearing at the ISU Four Continents Championships and World Team Trophy. 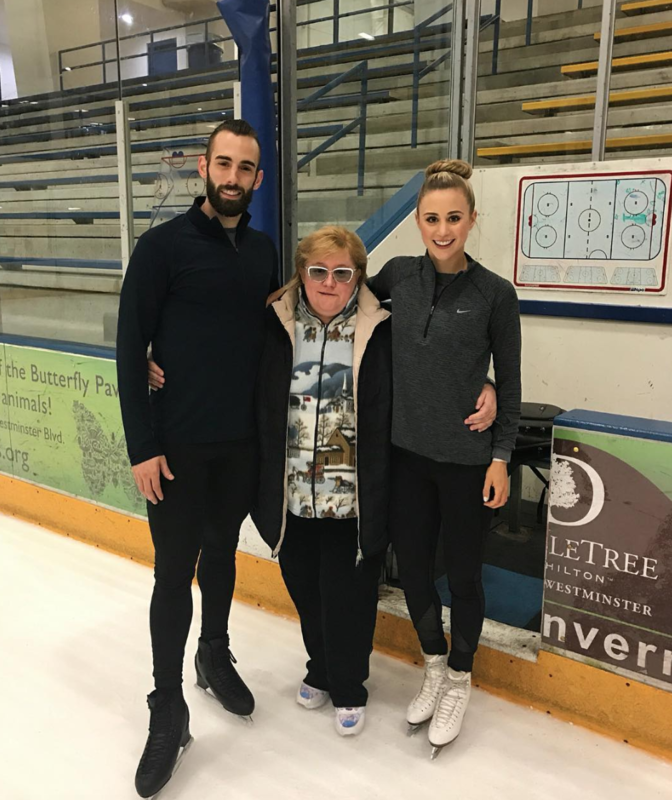 Last season, Cain and LeDuc hoped to earn the sole pairs berth on the U.S. Olympic figure skating team. However, they ran into some setbacks in their sophomore season, struggling with inconsistent technical elements and negative feedback about their long program. But Cain and LeDuc persevered and ended the season on a high note. After a disappointing 8th-place finish in the short program at U.S. Nationals, the couple rallied in the long program, where they put out a successful, crowd-pleasing routine to music from The Great Gatsby film soundtrack to pull up to fourth overall. The following month, they won silver at Four Continents. Now, as they look forward to their third season together, Cain and LeDuc are feeling a new level of confidence with their technical elements. And artistically, they have a clear vision of the picture they want to present on the ice next season. 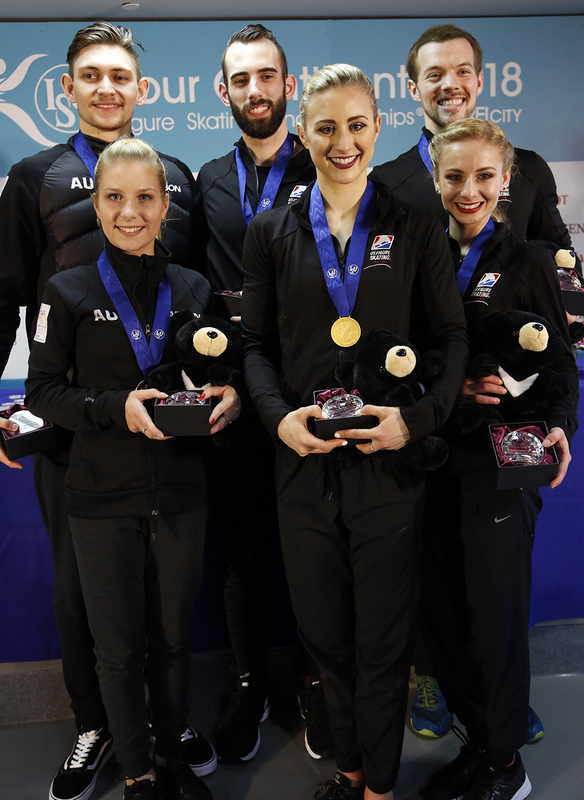 “We’ve found our groove,” declared Ashley Cain in a recent phone interview with Figure Skaters Online. As the new season approaches, Cain and LeDuc are focused on improving every day, climbing the ranks internationally, and helping to raise the fortunes of U.S. pairs skating. Figure Skaters Online (FSO): Ashley and Timothy, you had some ups and downs last year. But your season ended well, with the silver medal at Four Continents. Can you talk a bit about last season, and how it felt to finish on such a high note? Timothy LeDuc: So, last season … Being a second-year team is really difficult. Because you have a little bit more expectation. Ashley and I were both still really developing in our partnership. There was never a time when we felt really comfortable with the elements, because everything was growing and changing. We didn’t have that advantage that a lot of our competitors did–they’d been together so many years that they know the speed and timing of each of their elements. So last season, the right word, without overselling it … “Tumultuous” comes to mind. At times, it was a little tumultuous. We did so much. We went to so many different camps and [training] places. It took a lot out of us. So after the season was done, we wanted to mentally just chill and think, wow, what happened. 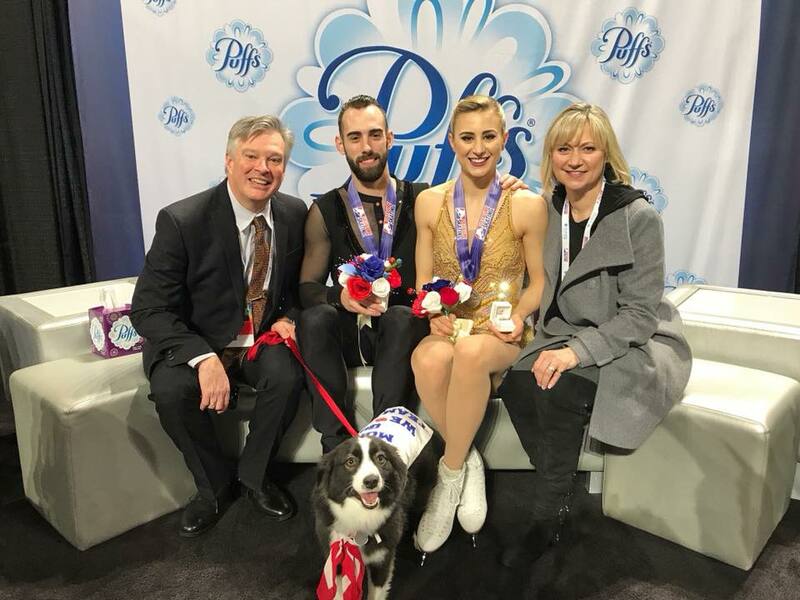 Ashley Cain: Being in first after the short [program at Four Continents] and earning the silver medal … It showed us that, through all the challenges this season, we just grew and came out stronger in the end. We felt like at Four Continents, we finally found our groove. And we felt [the] most comfortable in those two programs that I think we did all season. It was nice to end the season, that was just so uncertain, on two performances like that. LeDuc: And U.S. Nationals, as well. LeDuc: That (U.S. Nationals) was an important moment for us, personally. Not just who we are as competitors and athletes, but personally. For us to overcome everything that we had been through in this season, and after the short program, too. Just dealing with the disappointment and the constant pressure, all year, of: “We really want to be on the Olympic team. We have to make the Olympics. We have to be that one team, to get that one spot.” Just getting through that, at the end of the long [program at Nationals], was great. Cain: Going into Nationals, you have all these hopes: “Okay, I’m so close to the Olympics.” But there was only one team that could go. And I think after the short [program], when we were sitting so low in the standings … We came to the realization together: “Okay, maybe the Olympics are out of the question now. But we can still get Four Continents. We can still be alternates for Worlds. And we can move ourselves up on the team envelope.” So, we could still come out of the competition with a lot of positives. That’s exactly what our mentality was, going into the long program. To not give up, and leave feeling that we gave 100% in that long program. LeDuc: I think that’s why, if you watch the conclusion of that long program, we were so emotional. It wasn’t a perfect program. We had mistakes, we knew that. But it was just the relief, from everything that had gone up to that, and knowing we had given 110%. It was just so satisfying. That’s why we were so emotional. Cain: I think, too, with that particular program … We had gotten a lot of negative feedback on the program at the beginning of the season, and people wanted us to change it. And we said no. We stuck with it, because we felt very connected to this program, because we thought it was something different. It was a different approach than teams had taken before. So when we got the [audience] response …. We were in our final spin at Nationals, and people were already on their feet, because they felt they wanted to get up, they wanted to dance, and it made them feel good. That is exactly what we wanted. And I think that’s what made it so special. We were literally yelling with the audience, we were so excited. FSO: You had a terrific ending to the season, including at Four Continents. Cain: We were very happy. FSO: I enjoyed watching your Great Gatsby long program every time I saw it last season. I’m glad you stuck with it. LeDuc: It was, honestly, the single hardest program. Not just endurance- and condition-wise, but all of it. LeDuc: It was such a hard program. But I think it was perfect for a second-year team, because it pushed us so hard. Cain: And it shows that we’re willing to do something that’s different, and we’re never going to stay in our comfort zone. FSO: You chose Pasquale Camerlengo to choreograph your programs for this coming season. What led you to Pasquale? LeDuc: This year, we had an opportunity to work with Pasquale. We had seen him around at competitions; we’d known him for a long time. And we really jumped at the opportunity to work with him. I really appreciate his style, and the finesse he gives his athletes. And I thought he would be perfect to package us in order to really move up in the world standings. Cain: Also, for both our programs this year, and just moving forward as a team, we really want to incorporate more ice dance-style skating into our partnership. That’s how we want to look on the ice. Because our body types are very “ice dancer.” Our height difference is very ice dance. So that’s what we want to create. We want to bring that into pairs skating. We want to be flowing, and then right up into a Lutz. That’s what we want to incorporate. I think Pasquale was the perfect person to do that. FSO: How did you choose your program music this year? Did you work with Pasquale on that? LeDuc: We certainly had his input. Choosing music for programs is always really tough, because you have to find what exact style and idea you want to go with for the season. As we were throwing around different ideas, an image of Ashley in the Nationals long program [kept coming]. When we had that change of music. And she points at me, and does this pose, and it was just this moment of pure star quality. Amazing charisma and sass. I could not get that image out of my head. And by the way, that [moment] was completely improvised, because we were about three to four seconds early on the music. So, in that moment, on Nationals ice, we had to make up something on the spot. And that’s what came out of Ashley. We did not want to lose that star quality; it’s so relatable to an audience, so fun. We needed something that would harness that quality in one of the programs. And then also, we know we do lyrical and ethereal style well, and we didn’t get to do that as much last season. So we wanted to bring that back. Those are the two paths we chose this year: One program being that very fun, flirty, charismatic diva. And the other being more of that lyrical, ethereal, classic ice dance look. FSO: Your short program music is jive. Cain: Yes, it’s called “Bella Belle,” by the Electric Swing Circus. FSO: And the music for your long program is from the film W.E. You mentioned that you wanted to go in a lyrical direction with this piece. Were you inspired by the type of ice dance programs that Papadakis/Cizeron have shown in the last few years? LeDuc: Oh, yeah. I mean, I could only ever hope to move the way that Guillaume Cizeron moves. But if I could harness even just a small amount of his movement …. Cain: We also think of Madison Hubbell/Zach Donohue. That’s more of what we would look like, maybe, on the ice. FSO: With the long program, are you playing characters, or are you just portraying the mood of the piece? LeDuc: We do have a story associated with it. Now, because the choreography and the program is so new, we’re thinking so much about what our feet are doing. In the future, we can talk a little more about what that character is. But it’s not … Ashley and I are never the Romeo & Juliet pair. We never will do the “we’re lovers” [theme]. Cain: Or that he’s the stem and I’m the flower. LeDuc: –Two very strong athletes, equally showing their talents and entertaining the audience. So it’s very much that, but with more of an ethereal vehicle for the W.E. long program. FSO: Although that music is lyrical, there’s a powerful element to it as well. LeDuc: Yes. It’s haunting at times. I’m really excited for it. Even though the program is new and we’re not real relaxed with it yet, I really like the movement that we’re doing with it so far. I’m excited for how this program develops. I really think it will be special. FSO: Since you had such success with The Great Gatsby last year, were you tempted to keep going in that direction with your long program? Or did you want a change of pace? FSO: Right. Watching your Gatsby long program, I thought: “Oh, this program must have been challenging to skate.” Because you had more actual choreography than in the majority of pairs programs. Cain: Charlie White was doing the commentating for Four Continents. And he made it known, to the audience, how hard our program actually was, while still hitting the elements. Because we were hitting every single beat, and we were still moving with speed. So that was really cool to hear that, from Charlie. LeDuc: That’s what we’re going for. We [were] a second-year team, so there are going to be inherent challenges with that. But we are trying to push the sport forward, and we’re going to continue doing that. FSO: Speaking of the direction of the sport, there are a lot of changes to the scoring system that have either been passed or are up for a vote at the ISU Congress in June. [Note: The ISU Congress meeting takes place June 4-8 in Seville, Spain.] What are your thoughts on the rules changes? LeDuc: I’m very excited for these changes. Particularly the [change to] +5/-5 GOE. I think incentivizing quality is going to push the sport forward and make it more palatable for a wider range of spectators. So I’m really excited to see how that will change things. I think that for Ashley and I particularly, it’s great. In pairs, before, it was really hard to win on, say, the difference between a really good side-by-side spin and a great side-by-side spin. If you did a solid side-by-side spin, versus someone who was knocking it out of the park with that element, the point difference was going to be really minimal. Now, with this +5/-5, you can start to really gain points on the field off a [strong] element, because the GOE increases exponentially. So I’m really excited to see how that will mix things up. I think it’s a good idea to incentivize quality and innovation across all elements. 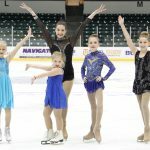 FSO: In terms of the pairs free skates, how do you feel about the reduction in length and proposed elimination of the side-by-side spin from the free skates? LeDuc: Side-by-side spin is one of my personal favorite elements. Cain: Mine, too. I’m a little sad about that. LeDuc: The pairs spin is the bane of my existence. So I’m a little sad not to see the side-by-side spin in the long [program], on a personal level. So far, as we’ve been skating the [long] program, I haven’t noticed that we’re having to run, or race, to get the elements done because of the lack of 30 seconds. But that could change as things develop. So ask me again in a few months, after we’ve really trained the program. FSO: Tim, I have to ask: What do you hate about pairs combination spins? LeDuc: Oh, wow. [Laughs.] I think that I’m a good pairs skater. But I have my limits. I can do a lot of things on the ice. But I cannot do a spread eagle. I never will be able to do a spread eagle properly, like Brian Boitano. That will just never happen. Pairs spins–I don’t know. Something about spinning around another person and sharing the center and fighting all those [gravitational] forces has always been really tough for me. I don’t know why. Everyone has a weakness. I think the pairs spin is something I’ve never really had a great feel for. [But] we’ve figured out a way to still make it look kind of good. What I love about the side-by-spins is that we can both be responsible for ourselves and do our element. But I love having to fight to speed up or slow down [to keep unison]. It’s really interesting and fun, the side-by-side spin. Trying to get it faster and in sync. Cain: I also feel like you can be very creative with the side-by-side spins. With the pairs spin, you do see a lot of the same positions. That said, we have tried to create a pairs spin this year that has different positions, that plays to our strengths. FSO: At the last ISU Congress, they passed a rule eliminating the choreographic sequence in the free skate. Now at this Congress, the proposal is to put the choreographic sequence back in, while taking the side-by-side spin out. LeDuc: The concept of a choreographic sequence, I love. Because it designates a set period of time in the program where you have to focus on very high-quality, innovative transitions. So I am an advocate for the choreographic sequence. FSO: Aside from rules changes, there will be changes next year in the competitive landscape in pairs, with retirements. And some pairs have split. Do you have any thoughts on the competitive landscape next season, and where you’re hoping to fit into it? LeDuc: Oh, gosh. The year after an Olympic season is always interesting to see, in pairs, what happens. If there’s musical pairs, and people start switching partners around, and switching coaches and everything. Our goal as a team remains the same as it has been since Day 1. And that is, push ourselves to be the best that we can be, and win medals across the board. Cain: I read a quote from Guillaume Cizeron. He said he goes to the rink every day to become a better artist, and to become a better athlete. And I think that’s what we have in our mind. On the day, we just want to be the best pair that we can be. We also want to be great ambassadors for pairs skating, especially here in the U.S. We do everything we can to give back to the developing teams, because we need that. That’s one of our biggest goals. We want to be on the World team, we want to get those spots back for the other pairs teams. We want to be the best team that we can be, but it’s not just about us. It’s about something so much bigger that we want to help create. LeDuc: Absolutely. Push the sport forward, domestically and internationally. FSO: Obviously, next year is going to be challenging for U.S. pairs, with the United States having only one berth for Worlds. Is that something that U.S. Figure Skating (USFS) has talked about with you and other senior U.S. pairs? As in, how do we deal with this situation, and how do we move forward and get more spots for the future? Cain: I think that they’re trying to give us all the resources so that [the U.S.] can be a top team again, a top country in pairs skating. They’re really going out of their way to give all of the [pairs] teams resources. They’re making sure that people are ready way before Champs Camp, way before Skate Detroit. So by the time Nationals comes around, they know that the teams they’re sending out are going to be strong. I think that’s where things are at right now. There’s only so much that they can do. Because, at the end of the day, it comes down to two people that are out on the ice, and if they want to do their job. FSO: Speaking of trying to improve … Last year, you worked with renowned Russian coach Nina Mozer. You even trained with her group in Italy. Are you going to continue that this year? Cain: We’re actually working with her in a few weeks, because we’ll go to pairs camp [National Pairs Camp, June 9-15]. And we’ll see her then. As far as working with her during the season, that hasn’t been determined yet. We don’t plan to do a three-week camp again, just because we’re competing at Skate Detroit [July 17-21]. So it would be a little hard to do three weeks in the summer. But, whenever we could work with her, we would love to again. We still feel like we’re part of her team. And she keeps in contact with us. They have us send them videos, and they send us back tips. We’ve created a really good relationship with that whole team. FSO: Do you feel like your work with Nina was most helpful technically, artistically, or both? Cain: Oh, I think both. Also mentally. It was just such an eye-opener, to see how they train. And she allowed us to share everything with our coaches, and we were able to apply it. FSO: Were there specific changes you incorporated into your training after working with Nina? Cain: Well, our twist technique changed, because she had us change the arm. I think the biggest thing is that she’s the kind of person that you get on, you do your work, you don’t mess around, and then after you’re done, you get off the ice. You don’t waste time with things that are unnecessary. And I think that is one of the biggest things that we learned from her. Not that we did the opposite before. Sometimes, people think you have to spend hours on the ice to do all this stuff. But her thing is, you get on, you do your work, and you get off. She also instills this sense of confidence in you that was so refreshing. Before we started training with her, I never thought she would know who I was. The fact that she was looking at me, and taking my hand, and telling me: “You’re going to do this. You’re going to be fine.” I was like: “Okay.” That’s what she does. She’s such a good person at putting confidence in your skating. FSO: Last year, you made great progress with your triple twist, getting much more height on it. Ashley, you mentioned that Nina changed the arm position on your twist? Cain: Yes. Originally, I was rotating with my arms both in front. Which was taking away a bit from our height on the twist. But it was the only rotating position that I had ever known. I had never rotated [with] one arm in front, one arm behind. So when we started that with Nina, it was, like, terrifying. I said: “I don’t know if this is going to work. Can we go back?” And Nina said: “No, no, it’s going to work.” And finally we found a rhythm with it. So now, I rotate it with one arm in front, one behind. Which is what you see most teams doing. LeDuc: We’re continuing to apply the techniques that Nina gave to us when we trained with her. From Nina’s perspective, you can give a student a tool and suggestions. But it takes time to learn to apply it and for it to really become their own. So, we got a lot of input and info about the [triple] twist from Nina, but it takes time to get comfortable with it. We’re trying to do that this off-season, just really apply everything we learned and make it our own. FSO: How about side-by-side jumps? Last year, you started the season doing triple flip in the short program. Then you switched to triple loop. Which jump will you use in the short program this season? LeDuc: Our plan is to keep the jumps the same as what we did in the second half of the season last year. Because that’s when we started finding our groove and finding better GOE [marks]. Cain: And with the +5/-5 GOE happening, we’re looking at [triple loop as] a jump that we are very consistent in and very confident in, that we can get big positive GOE on. We do triple flip and triple Lutz every single day; we work on them. But, we’ve competed triple loop and triple Salchow so many times that our bodies know how to do them. And we want to maximize the amount of points, because we’re putting so much into our choreography this year, that we won’t be able to perform the choreography full out [unless] we’re feeling confident on the elements we’re doing. We always still train flip and Lutz and toe loop. Because we don’t ever want to be a team that just stays with what we’ve always done. We want to keep evolving. I think that, as the sport moves forward, you’re going to need triple flip and Lutz, and you’re going to possibly need a triple/triple in pairs. So we always want to be practicing those. FSO: Will you keep the same side-by-side jump layout for your long program as well? LeDuc: Yes, that’s the plan. FSO: What are you focusing on with lifts this season? Adding new lifts, or refining your existing lifts? LeDuc: Some of both. We always want to refine our lifts, make them faster and stronger and smoother. Obviously, the short program lift is going to change, because it’s a Group 4 [lift this year]. So we’ll have a new one for that. And trying to match the movement of that lift with the theme of the music–that’s been a fun process. We’re excited about what we’ve come up with for that lift. The back lasso [lift], that we were doing last year, we’re [now] working on the reverse lasso [lift]. It’s an extra half point. So we’re working that into the program right now. Attaining the level 4 is a little more difficult in that [reverse] handhold position. FSO: Last year, you were pretty consistent with your throw jumps; there weren’t many falls. But there were some forward landings. Is that something you’re working on for next season? Cain: For sure. I think last year, a lot of those forward landings and misses were due to me not exactly being comfortable with the technique yet. Compared to [our] first year, when we did throws … The throws that year were a bit slower. I had a different handhold. Last year, we changed the handhold, and we added speed. The height increased as well. So they definitely increased in difficulty. They were a little bit harder for me, mentally, to do. Now, I feel like I’m in a really good place with them, and that’s a big thing I’ve come to terms with during this off-season. And right before Four Continents as well. Finally, I felt like I understood a technique for every element that we were doing. That every single time, it was the same. Before, we were still learning, as a team, and getting used to pairs skating again. There was a technique, but it was, at times, very different. I feel like now, we know every time where it’s supposed to be, the amount of speed. And if something is off, we know exactly what went off. LeDuc: That’s back to what we were talking about earlier. Which is, that it’s difficult being a first- and second-year team. Because your elements are constantly growing, and you’re getting stronger and moving faster. That was definitely a hard thing about last year. Think about the way the twist grew from the beginning of the season to how we did it at Four Continents. We are still growing, we are still developing, and getting stronger as a team. But we just have another season under our belt of learning that timing and strength. Cain: Also, this year we have a true off-season. The first year, we got together in May. So our off-season was spent making programs, going to pairs camp, doing all of these things to get us ready to be on the international circuit in September. Then, after World Team Trophy [in 2017], we got done in late April that year. And we had to go to pairs camp in June. Everything just came very, very quick. And we didn’t really have an off-season. So this year, we’ve actually been able to have an off-season and train and improve the elements without having to run programs right away. We’ve also branched out and done shows and seminars. FSO: This year, you’re planning to start your season at Skate Detroit? Cain: Yes. We’re doing Skate Detroit because we have [to show] readiness for USFS, so many days out from our international competitions. We also want to be able to skate in a place where our choreographer is. So, after the competition is over, we’ll be able to work with Pasquale. FSO: The last few seasons, you’ve done 2 or 3 Challenger Series events. Will you do that again this year? LeDuc: We would love to have 2 Grand Prix [events] and 2 Challenger Series. That will all be decided pretty soon, I think. FSO: Any particular events that you’d like to go to? Cain: NHK Trophy! Any competition in Japan is incredible. FSO: In terms of off-ice stuff, Ashley, have you set a date for your wedding yet? And are you working on wedding plans? Cain: Yes. June 1, 2019, is when the wedding will be. We have a venue; it’s a huge white barn, out in the country. It’ll be a pretty huge wedding, because we both have big families, and lots of friends. We’re excited. FSO: Have you been looking at wedding dresses? Cain: I actually have a really special story for my dress. It’s an idea, and we’ve talked about it with my dressmaker, Denyse Frey, who has made my [skating] outfits for years now. Hopefully it works out. Denyse is going to make the top of the dress. And then we’re going to put my mom’s train, because it’s still in perfect condition, on the dress. 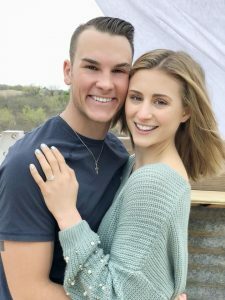 FSO: Your fiance, Dalton Gribble, was not involved in figure skating before you met. How much has he learned about skating? And does he enjoy watching it? Cain: He is the best. With the Olympics, he watched every event from start to finish with me. And it’s like that for every Grand Prix, any competition. If he’s driving, I’ll be watching the competition live on my phone, and he’ll be totally fine with it. Well, at least, I hope so. And he takes part in the conversations about figure skating, and learns the names of the elements. He’s truly interested in the sport, which is really nice. And he’s very understanding of the crazy schedule that I have, with all the travel. He was literally thrown into this crazy world of figure skating. He never knew a figure skater–I think he skated once in hockey skates when he was a little kid. And he’s done a really great job of managing all of it. I feel like he’s always there to support me. And Jackson Ultima provided him with skates, which was awesome. He’s actually quite good. He’ll just throw himself around and try jumps and things. LeDuc: And Dalton is partner-approved, if you’re wondering. I really like Dalton. FSO: Yes, we heard that Dalton told you about the engagement ahead of time, Tim. LeDuc: I knew for, like, a year. [Laughs] I’ve been told I’m pretty good at keeping secrets. FSO: Well, congratulations on your engagement, Ashley! And good luck with your training and competition next season!